The modern Chilterns is an area of land which stretches north-east from Reading in the Thames Valley to Hitchin in modern Hertfordshire. 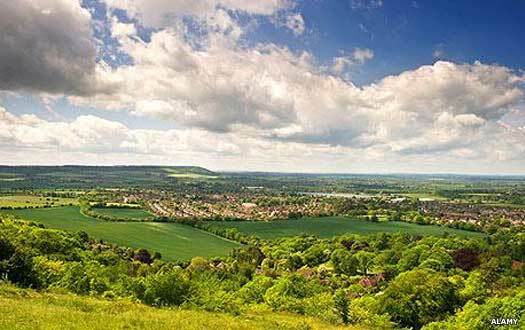 The highest points are over 250 metres above sea level and there are various water courses which cut through the Chilterns to head towards the south-east of England. Bands of Saxon settlers were arriving as Thames Valley Saxons throughout the eastern length of the Thames during the fifth century, and some of these headed northwards during the later fifth century (and perhaps earlier), where they formed communities well before AD 500. Other Angle and Saxon groups migrated south from the Midlands, heading down from their initial landing point around the Wash with many groups settling along the way. These formed the Middle Angles, but some of their groups continued to move southwards, migrating beyond the reach of their fellows. Through the course of the sixth century they cut through the western territories of the British kingdom of Cynwidion in the Chilterns. This isolated it entirely, and the enclave was gradually squeezed until around AD 610-630 when the British administration there collapsed. By this time the new arrivals had adopted the British name for the region to become the Ciltern Saetan (Chiltern settlers), and they had already carved out a territory for themselves which was centred on the modern Chilterns. There is good evidence from burials that Saxons (and quite possibly Jutes from Kent, just as with the Middel Seaxe) penetrated well into western Northamptonshire with cemeteries in a linear alignment along the ancient 'Port-way' that is reputed to have run from Dorchester-on-Thames to Leicester. These are recorded at Marston St Lawrence, Newnham, and Welton, with a possible further example at Churchover in Warwickshire. Recent archaeological investigation undertaken by the CLASP group (see sources, below) between 2000-2012 on a site that was immediately adjacent to Watling Street at Whitehall Farm in Nether Heyford has revealed a small Anglo-Saxon cemetery with the earliest burial being dated to AD 450. There is a view that the earliest Saxons and Kentish Jutes to arrive in the region could have been acting as foederati, an entirely accepted method of defending vulnerable areas in the fifth century. While the Middle Angles had been hemmed on the west of their advance by the great forest of Arden, there had been no such obstacles to the south of their advance, so it was natural that they should reach the Chilterns. This also meant that it was just as easy for later conquerors to access their territory as it had been for them to take the land from the Britons. As a result, by the middle of the seventh century the Ciltern Saetan had fallen under Mercian dominance. They may have been able to establish their own rulers as sub-kings before that date, but afterwards, any local rulers were probably appointed by Mercia. Saxons advance along the Thames Valley, encroaching on Caer Celemion's northern border (by circa 470), and also heading north into the Chilterns to encroach on the territory of Cynwidion (by circa 480-500). Other Angle and Saxon groups head southwards from the Midlands, through the Vale of Aylesbury from the territory of the Middil Engle, to cut Cynwidion off from the west. Archaeological investigation work undertaken by the CLASP group (see sources, above) between 2000-2012 on a site that lies immediately adjacent to Watling Street at Whitehall Farm in Nether Heyford reveals a small Anglo-Saxon cemetery with the earliest burial being dated to around this time (although the bulk of them date to the seventh century). Curiously the cemetery is located next to a Roman villa and farm. The villa is a sophisticated one, with its own bath house complex, and is the centre of an agricultural estate that extends over about ten acres. If this is still active at this time then the first Saxons to arrive may even be employed as farm workers. The find that that bath house is fired for the last time around this period would suggest that the farm is indeed still active, if possibly in decline. In the sixth century a wooden hall is built over the site of the Romano-British villa, suggesting the farm's continuation, but probably in the hands of Saxon settlers. To the east of this area cremations predominate for the earliest burials, which is apparently typical for the Middle Angles who soon begin to encroach from the east. It may well be that Watling Street is an approximate demarcation line between the two groupings in the early days of settlement. A comment by Wendy Davies at a conference on Mercia which had been held in Leicester in 1975 is collated with others in a book called Mercian Studies. Amongst other comments, Ms Davies mentions from the analysis of various early documents that there is an invasion from East Anglia into what becomes Mercia in the early sixth century - exactly at the time proposed here for the Iclingas. There is no indication of precisely where this invasion takes place or how far it penetrates to the west. Does it reach as far as Watling Street and also feed the creation of the Ciltern Saetan in Northamptonshire? The change of name for the British kingdom of Cynwidion at this time suggests that territory to the north and west may already have been lost, probably to the Middil Engle, who are known to occupy territory to the north of the British kingdom by this time, and to the newly arriving Ciltern Saetan (settlers) to the west. The openness of the Chilterns to the north-west, which had been perfect for the arrival of the Ciltern Saetan, is matched by its openness to the south-west, which provides less than perfect access for the West Seaxe. They now conquer the Ciltern Saetan, reducing them either to the position of a client kingdom (although the West Seaxe tend not to do this), or removing local rulers entirely. By this date, if not before, the West Seaxe control all of the Thames Valley Saxons and are probably dominant over the Ciltern settlers themselves. The presence of the Ciltern Saetan and their no doubt increasing dominance in the region helps to force the collapse of the British kingdom of Cynwidion. The Saxons of the Ciltern have become a client kingdom of the much more powerful Mercia. Their (eastern) population of Britons seems not to receive any further mention in surviving historical records. Instead they are probably treated as second class citizens and gradually become incorporated into the Ciltern domains.